Today I’m sharing my cucumber relish because it’s easy and tastes delicious. I am still picking vegetables out of my garden as it’s still giving plenty for us to eat even though summer is coming to an end. If I don’t have it in my garden I usually will pick up fruit at a reduced cost of 50% off which saves me lots of money in my grocery budget. Don’t turn your nose up at these budget saving gems! I don’t know how many times I have made jam or homemade lemonade or anything from the supermarket not good enough to sell at full price. It may have been dented, bruised or even have one disfigured piece of fruit or vegetable in the bag. This doesn’t mean it’s not good to eat it simply means you have to put a bit more work into preparing the food now rather than later. Typically food that I get on the reduced rack doesn’t last long in the refrigerator so I have to use them up right away which normally isn’t an issue as I have frugal recipes up my sleeve. There is actually a supermarket chain in France called “Intermarche” that has now taken up the concept of the “not good enough to put on display” and is actually putting food out at reduced prices. I know that I would be buying it especially if it saves us money in our grocery budget which I like to stretch when I can. It all tastes the same but we all still have this misconception about how our food should look. My friends also know I can and don’t waste a thing. Today is no exception as a friend brought over a big bag of cucumbers for me to use up. “Yum” I said and knew that cucumber relish was in my future. My family enjoys condiments to add flavour to our foods so if I can create an easy cucumber recipe such as relish from a few cucumbers I will. Having already called ahead to let me know she was coming by I was one step ahead and had already took out my jars and put them into the dishwasher to clean and sanitize. What people ask if you can put your canning jars in the dishwater I simply respond, “Why yes you can” however just keep them there hot until you need them rather than taking them out. If you are doing a smaller amount of canning then the microwave is a great way of doing two or three at a time canning jars at a time. Cucumber recipes are easy to find because we traditionally use cucumbers to make relish, tzatziki or pickling cucumbers to make pickles. Some alternate recipes I had planned on creating with the cucumbers were dill pickles and bread and butter pickles. I was also set up to make some jam this week from 50% off fruit from the store. This week I was able to find blueberries at a great price. I also froze some blueberries so my husband could make some homemade blueberry ice-cream. Don’t worry once he makes it I’ll be sharing his famous ice-cream recipe with all of you. After I had done most of my canning I thanked my friend by sending her a photograph of the pickles. Her kids instantly asked if I could make some for them. I’ll be showing her how to can so she can make them at home for her family. So what else did I make with the cucumbers? Cucumber relish, that’s what I made. That’s right and for all of you that buy relish you must try this simple cucumber relish at home especially if you grow cucumbers. We use sweet cucumber relish in our house to put on burgers and hotdogs and going back to store-bought relish is something we never plan on doing. There are many relish recipes available online but this will be the only recipe you will need because it’s simple and quick to make. How to make cucumber relish from cucumbers? It’s easy and as long as you follow all the steps below in no time you will surprise your family with a gorgeous relish. 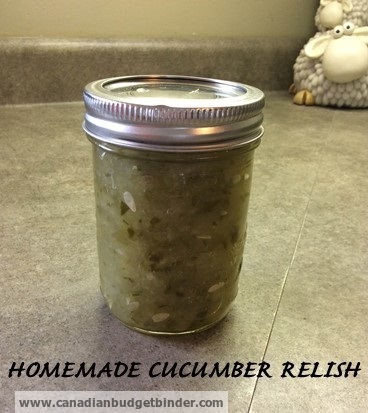 If you love relish this homemade cucumber relish is simple to make and will garnish your favourite foods with lots of flavour. Bring it up to a boil then back down to a simmer stirring constantly. If you find there is too much water and it's too runny just take away some of the juice. Now spoon it into the hot jars and seal. A simple sweet cucumber relish recipe that you can spice up any way you like. If you fancy your relish hot you can add hot peppers to make a spicy cucumber relish but if you like it sweet simply omit the peppers. Enjoy this cucumber relish all year-long with your favourite foods. Approximately how many cups of diced cucumbers would this be? We’re not big sweet relish fans, but I would love to learn how to make dill pickle relish one day. I need to add this to my list for next year – thanks, Nicola! What I sometimes do in the hot weather is add some relish to my macaroni salad, it’s very good! I can see adding a couple or three scoops of this to my salad!!! !